1.You must fund the deemed disposition tax that will arise when you die and use spousal rollover to defer the tax. Capital gains and losses will be triggered and tax will be payable on the net capital gains – top tax rate ranges from a low of 19.5 per cent in Alberta to a high of 25 per cent in Nova Scotia. Double tax exposure may not exist if you directly own shares of your operating business, but double tax planning will likely be required if you own shares of your operating business through a holding company or have investment assets or real estate in your company. The most common plan to avoid double tax must be completed by the executors of an individual’s estate within one year after the individual’s death. If your will transfers your shares to a spousal trust, the trust should be drafted to provide for its continuance for up to three years after your spouse’s or partner’s death. The executors should be advised that planning transactions will be required after death to avoid double tax and to seek tax advice. this strategy can save tax each year of up to $16,000 for each beneficiary even if the beneficiary receives all of the income. The savings will depend on the income earned in the trust and the province of residency. If you will be receiving a significant inheritance from a parent, these same advantages are available to you if your parent creates a trust in their will for your inheritance. Probate is an administrative procedure under which a court validates a deceased’s will and confirms the appointment of the executors. For estate assets having a value of $2 million, the probate fees range from a nominal fee in provinces such as Alberta, Northwest Territories, Nunavut, Quebec and the Yukon to a high of about $30,000 in Nova Scotia and Ontario. If you live in Ontario, consider the use of multiple wills for your private company shares and receivables to avoid Ontario probate on these assets. Consider named beneficiaries of insurance proceeds or create an insurance trust in your will to avoid probate on insurance proceeds. Similar planning could be considered by your parents. to transfer your business to your family? have you identified your successor? have you discussed this with your family? GST or the goods and services tax is a tax that applies to the supply of most goods and services in Canada. These include real propery and intangible personal property. HST or harmonized sales tax generally applies to the same base of property and services as GST. 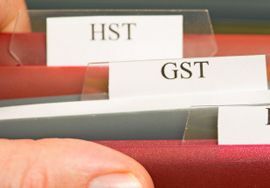 HST is imposed in participating provinces that have harmonized their provincial sales tax with the GST. New Brunswick, Nova Scotia, Newfoundland and Labrador, Ontario and Prince Edward Island are participating provinces. in the other provinces and territories, GST is imposed on taxable goods and services and there may also be a provincial sales tax or a retail sales tax in place. Most goods and services supplied in or imported into Canada are taxable supplies and are subject to GST and HST. Some supplies of good and services are are charged at a 0% taxation rate. 1.What programs can I apply for with the Business Name Search, Registration and Renewal application? You can use this application to perform a business name search, register or renew your business name, apply to the Ontario Ministry of Revenue for Employer Health Tax (EHT), and apply to the Workplace Safety and Insurance Board (WSIB). 2. Are there any changes to the business name registration process as a result of the implementation of the Harmonized Sales Tax (HST)? As of July 1, 2010 Retail Sales Tax (RST) registration is only required for specific types of insurance companies. All businesses in Ontario must apply for Employer Health Tax (EHT) and Workplace Safety and Insurance Board (WSIB) when applicable, as well as apply for an HST number with Canada Revenue Agency (CRA). The Integrated Business Services Application can no longer be used for RST application. If you have questions related to RST and/or EHT please contact 1 866 ONT TAXS (1 866 668 8297). To apply for CRA programs including Harmonized Sales Tax (HST), payroll deductions, corporate income tax and import/export accounts visit Business Registration Online. 3. What is a Master Business licence? A Master Business Licence confirms that a business name has been submitted to the Ministry of Government Services, Companies and Personal Property Security Branch for registration on the public record. It includes the registration and expiry dates, as well as the Business Identification Number. It can also be used as proof of registration for a business name at financial institutions. A Business Name registration is required to be renewed every five years and a new Master Business Licence will be issued. When the Master Business Licence is presented to any Ontario business program, the client is not required to repeat information contained on this licence. 4. How do I apply for a Master Business Licence? 5. What is the Service Guarantee? ServiceOntario guarantees that an electronic copy of your Master Business Licence (eMBL) will be sent to you by email within two (2) business days after the date you registered a new business name. If you do not receive your eMBL within two (2) business days, upon your request ServiceOntario will refund your business name registration fee if the terms and conditions for a refund have been met. 6. What is an electronic Master Business Licence (eMBL)? An eMBL is an electronic copy of the Master Business Licence delivered in PDF format via email. The eMBL is a copy of the immediate MBL received during a new business name registration. If an immediate MBL is not received during a business name registration and a valid email address is provided, the eMBL will replace the mailed paper copy. 7. How do I obtain an electronic Master Business Licence and become eligible for the Service Guarantee? You will obtain and become eligible for the Service Guarantee if you provide a valid email address and successfully register a new business name via the Integrated Business Services Application. 8. What forms of payments are accepted? Online registrations will only accept VISA, MasterCard or American Express payments. You can make payment by cash, cheque or money order at ServiceOntario Centres. 9. How long does it take to register a business name and receive a Master Business Licence (MBL)? The Integrated Business Service Application is available through the ServiceOntario website 24/7. It takes approximately 30 minutes to complete the registration. If you complete your registration between 8:30 am and 6:00 pm, an MBL is produced for printing immediately. In addition, if you provide a valid email address you will be sent an eMBL within 2 business days, regardless of when the registration was completed. If no valid e-mail address is provided and the registration is completed outside of these hours, the MBL will be sent through regular mail within ten business days. 10.Does this service apply to business name renewals or any other services associated with IBSA? No, the delivery of the electronic copy of the MBL within two (2) business days applies only to new business name registrations.